In many regions, the true arrival of spring is marked by the appearance of crocus flowers, one of the earliest bloomers in spring. They can often be seen peeking up through the snow well before any other flower blooms have appeared in the landscape. Crocuses are low-growing, clump-forming perennial plants grown from corms. Crocuses are in the Iris (Iridaceae) family. Bloom colors on the tube-shaped flowers include white, mauve, lavender, yellow, and striped. They are found growing in a range of conditions, from woodlands to coastal gardens to suburban lawns. Crocuses are most often planted for early spring color, although there are also varieties that bloom in late fall and early winter. Make sure to know what kind you are buying when choosing them for your landscape. There is a bit of variability in the size of crocus plants, but none are more than six inches tall by three or four inches wide. Crocuses are very adaptable and small enough to be tucked into flower beds, under trees or even in the lawn. There are over 80 species of crocus, but most of the bulbs (actually corms) available are mixes of different species and varieties. Roughly 30 different varieties are commonly sold and planted. The hybrids tend to bloom a little later, and mixing them with other species of crocus will give you a longer period of bloom. The Crocus originates in the Mediterranean regions and parts of Asia and China, but was brought to the Netherlands in the 1500s and quickly found their way across Europe. They were one of the first bulbs brought to the New World. Many of the commonly found spring-blooming crocuses are hybrids of Crocus vernus (Dutch crocus), with large, single flowers; or Crocus chrysanthus, which blooms a couple of weeks earlier and has smaller, but more profuse blooms. Crocus bulb hardiness will vary slightly depending on which type you are growing and exposure, but most crocuses are reliable within USDA Hardiness Zones 3 to 8. They bloom and survive best where winters are cold. Crocus corms need a 12 to 15 week period of cold temperatures (35 to 45 degrees F.) to set their blooms. Crocuses look best when they appear natural. Large drifts meandering throughout the garden, under trees, or naturalized throughout the lawn make a wonderful sight in early spring. The corms also do well in alpine and rock gardens and containers. They look especially beautiful in hypertufa troughs. To extend the bloom time, mix different species of crocus. Shopping through one of the catalogs that specialize in bulbs is the best way to make a good, reliable selection. Crocus planted in a protected spot can bloom weeks earlier than those in open exposure, like a lawn. This is also a good way to extend their blooming period. Planting them where other plants will fill in and hide their foliage will give the crocus a chance to store energy for the next season. The flowers fade quickly in the heat. Spring-blooming crocus should be planted in the early fall. Crocuses do best in full sun, but since they bloom so early in the year, there will be few leaves on the trees when they bloom, so spots that are shady in summer are fine for spring-blooming crocus. 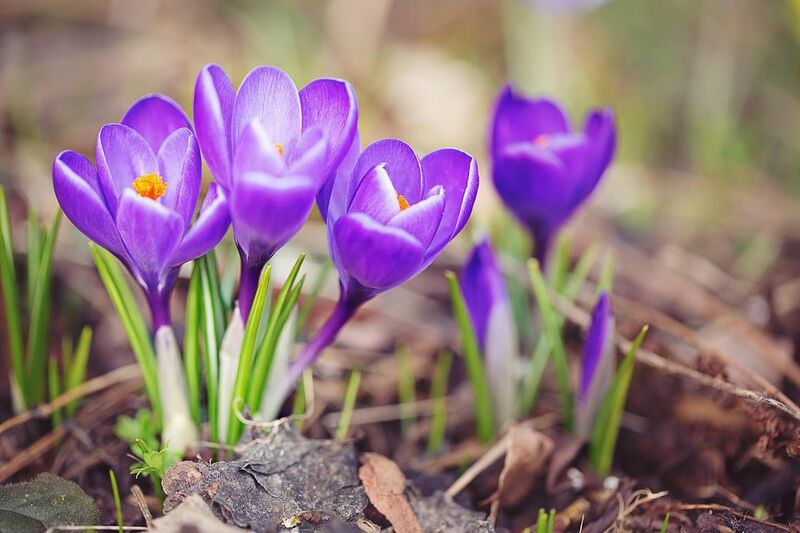 Crocus plants prefer a neutral soil pH of six or seven. More important than soil pH is good drainage. As with most bulb-like plants, crocuses do not like to sit in wet soil, especially during the summer, when they are dormant. Plant them about four inches deep and two to four inches apart, pointed-end up. It can sometimes be hard to tell which is the pointed end of a corm but don't worry too much: the plant will grow toward the light. Adding some bulb food or bone meal will ensure they have all the nutrients they need to get started. Crocuses require very little maintenance. They like to be watered regularly in the spring and fall. If there is no snow cover, the corms will also need water throughout the winter. They go dormant during the summer and prefer a drier soil during this time. Crocuses do not require a lot of fertilizer. They store their own energy in their corms, which is why it is essential that you do not cut back the leaves until they begin to turn yellow. However, a light top dressing of bulb food or bone meal in the fall is a good idea in poor soils. It is not necessary to divide your crocus plants. In many areas, crocuses are somewhat short-lived and you may need to replant every few years. If your crocuses do very well and start to multiply, they will eventually begin to bloom less as the clumps become denser. If that happens, you can lift and divide the corms when the foliage starts to die back and replant where you wish. Crocuses are susceptible to viruses, which can cause distortions, streaking, and buds that fail to open. There is no cure for viral diseases; if they strike, dispose of the plants to prevent spreading the virus. The biggest problem is corms and flowers being eaten by chipmunks, deer, rabbits, and squirrels An assortment of rodents feed on the corms themselves. And other animals, such as skunks, will dig them out of the ground while searching for insects. There are liquid deterrents that can be sprayed on the leaves and granular deterrents you can scatter to prevent nibbling. You can also buy wire cages to protect the corms when you plant them. If you find your plants are constantly being harmed, avoid using bone meal, which can attract animals. Instead, try interplanting your crocus with daffodils, which animals hate.